Welcome to a new blog post today! Are you all in a creative mood? It feels like spring al ready here in the Netherlands, just love those first warm days, always just a boost of energy for me! 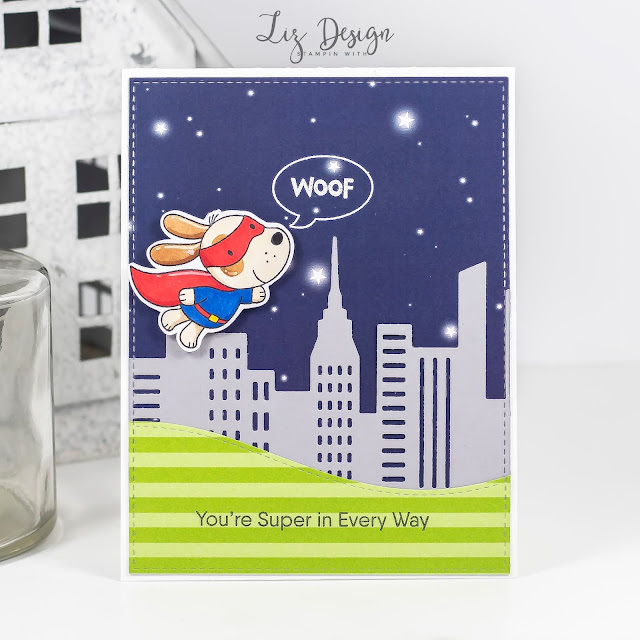 Today I'm showing you guys a fun card that I created with the Super Dog stamp set from My Favorite Things! I used two different pieces of design paper for this card. 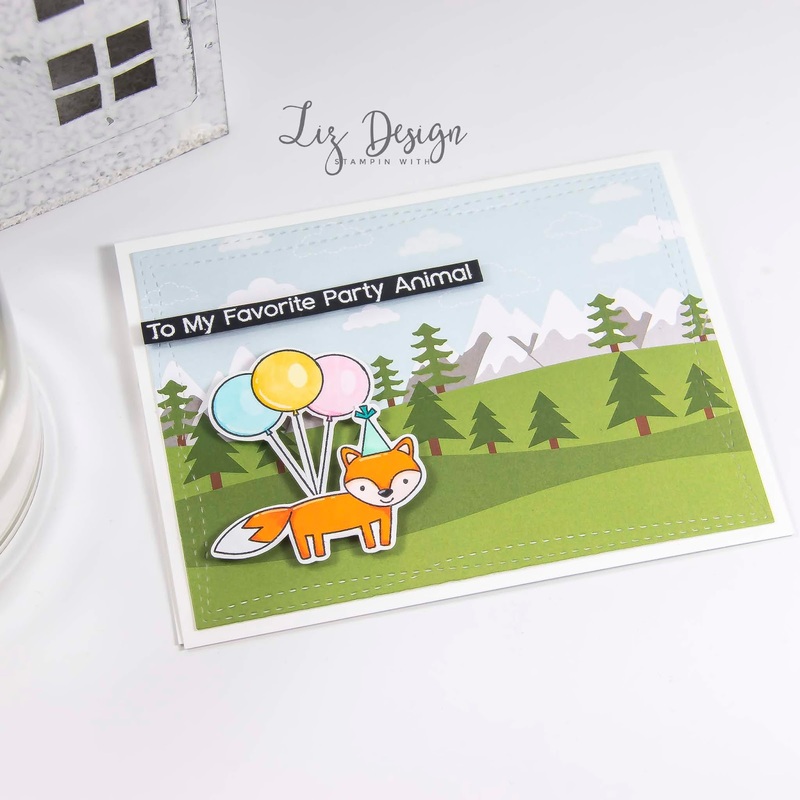 I just love how design paper can give your card such a fun boost. 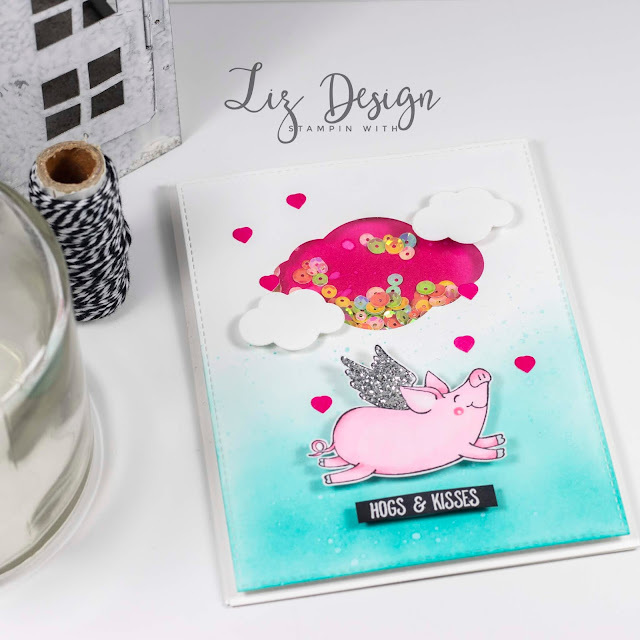 I used a night sky background from the Happy Camper Pad from Sugar Pea Designs, the same paper pad I used for my last card I showed you all this week. I diecutted this piece with the largest die from the Stitched Rectanges Die-Namics. 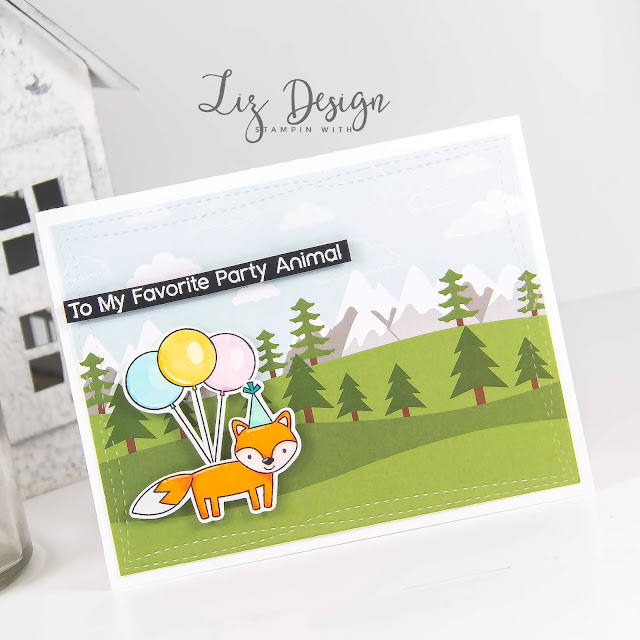 For the grassy kind of underground I used a piece of the Stampin Up Brights Design Paper Series. I diecutted this piece with the Stitched Snow Drift Die-namics and then with the Stitched Rectangle Die to make it a perfect fit with the sky. I diecutted a piece of grey cardstock with the City Block Die-namics. I also diecutted this piece with the Stitched Rectangle Die to make it match my other two pieces perfectly. 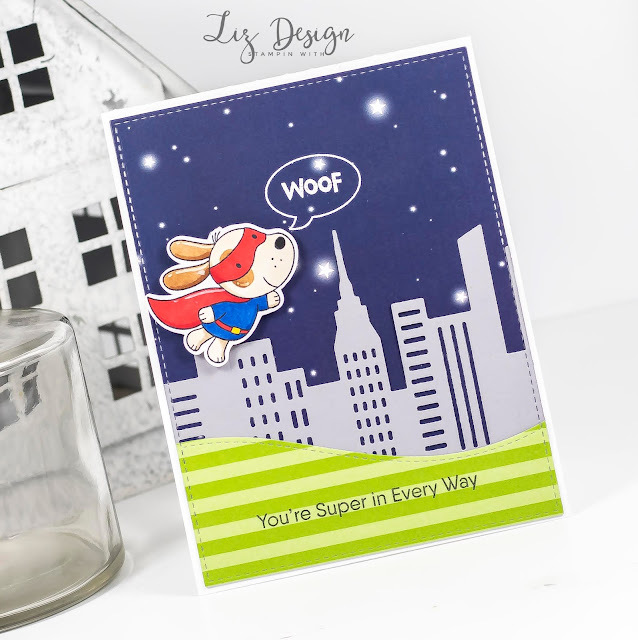 I stamped the tekst 'You're Super in Every Way' in the bottom and then adhered all my background pieces on to a white card base. 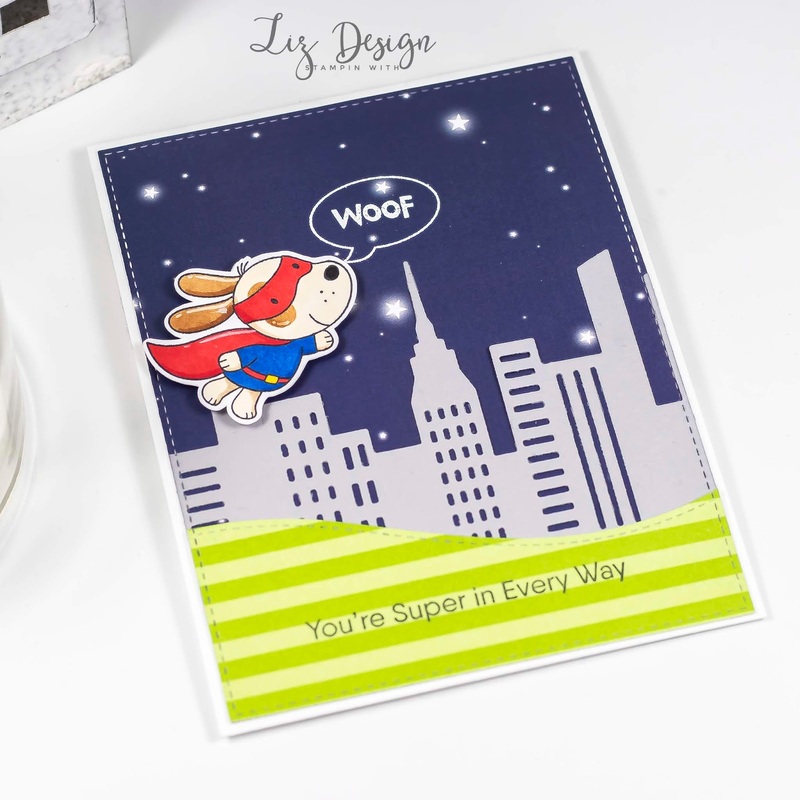 I stamped my super dog on Solar White Neenah cardstock and diecutted it before colouring with Copic Markers. I did a card with this set before and liked the look of the dog, so I gave this one the same colours as well. I added a tekst balloon on to my background by using Versamark ink and white embossing powder. Just heat set this for a fun textured look! Stampin with Liz Design: Birthday Bear & Friends Card! Hi everyone! It's finally time to show you guys a new fun card! I had a little stamping break last week, the kids had a school holiday and we did loads of things together, so stamping came a bit on a back burner. But today school started again, so I finally had time to sit down this morning to create something. I went for a simple, but fun card! I started my card by cutting a card base from white cardstock. I like to use A2 card sizes, so this card measures 14 x 21.6 cm. 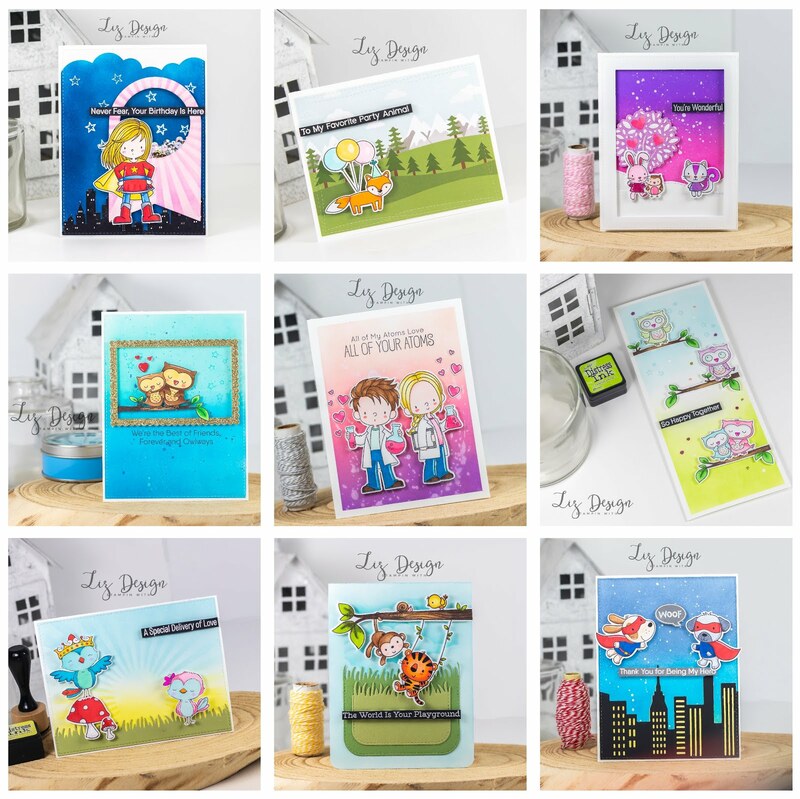 I then dieutted a cute piece of design paper from Sugar Pea Designs (Happy Camper Paper Pad) with the Wonky Stitched Rectangles Die-namics from Mft, that has a whole fun scenery on it! I kept this card very simple, the scenery al ready is just gorgeous and doesn't need much added. I added the cute little fox, text and balloons which you can find in the Mft stamp set Birthday Bear & Friends. I used my Scan 'N Cut machine to diecut the images, but you can of course use the coorindinating Birthday Bear & Friends Die-namics. I coloured my images with Copic Markers and placed them on to my card using dimensionals, so they would pop a bit more. 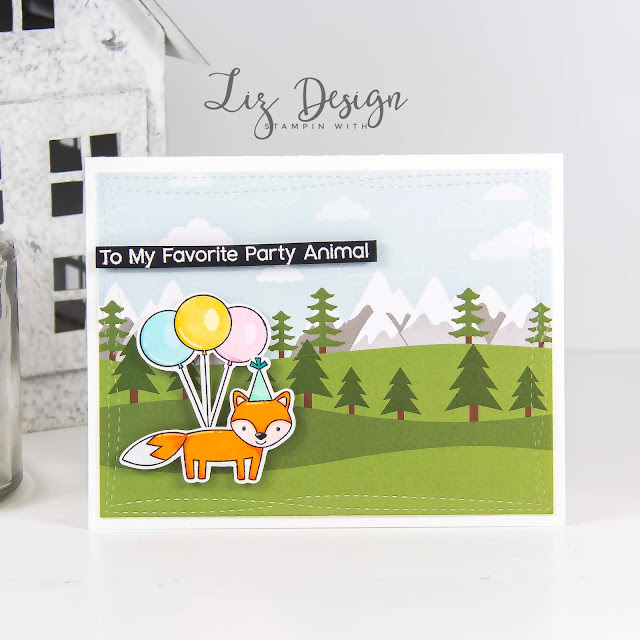 I added the text that I stamped on black cardstock also with dimensionals on to my card. Just a simple card, but so cute! Welcome to a new blog post! Today I'd like to show you all a fun, but simple card! I created this card with the Oh My Ostrich stamp set from Mft stamps. 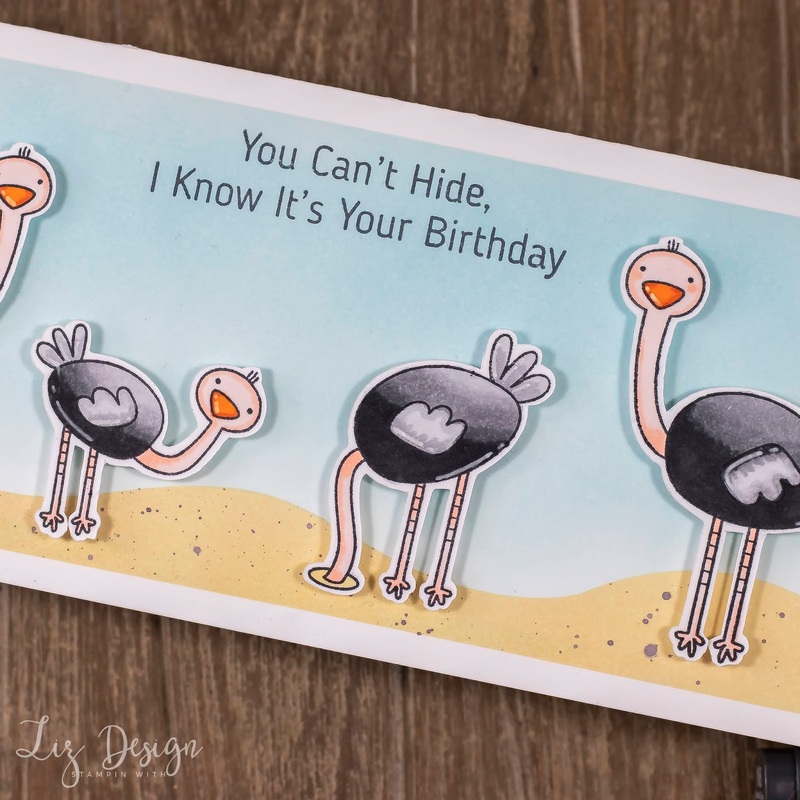 I thought this set was so funny with the Ostrich that sticks his head in to the ground and then the matching text! These birds are just so much fun! For this card I choose a longer card base then my usual A2 card size, so all the ostriches from the set would fit. I do love the longer and smaller cards though! I masked a frame with masking tape and coloured my background with a blending tool and Tumbled Glass and Antique Linen Ranger Distress ink. I masked the underground with masking tape that I diecutted with a die from the Stitched Snow Drifts Die-namics. I added some spatters to make the sand look more real. I then stamped and diecutted the ostriches. 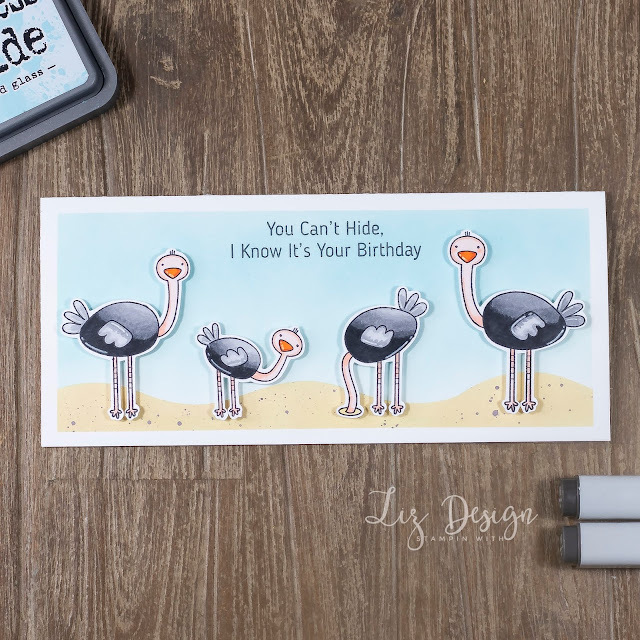 I use a Scan 'n Cut machine from Brother, but you can get coordinating Oh My Ostrich Die-namics with this stamp set of course! I coloured these cuties with Copic Markers and added them to my card with dimensionals. 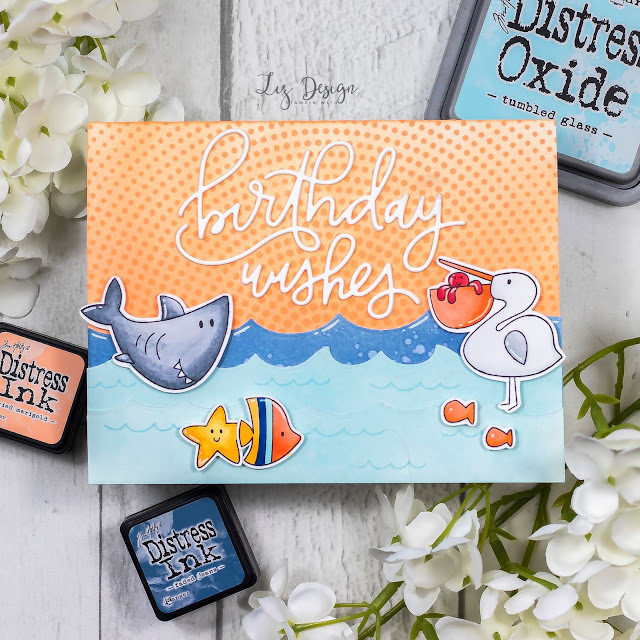 I stamped the fun text in the middle above to finish my card! 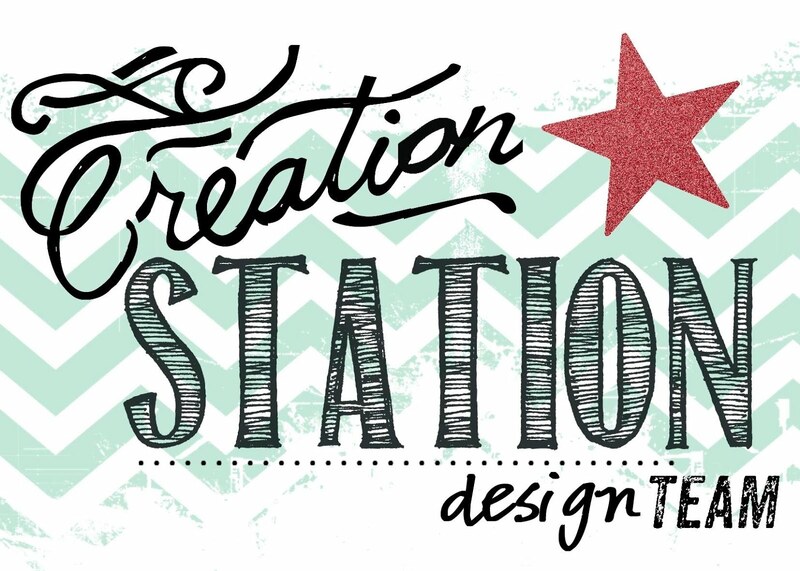 Welcome to a new Stampin with Liz Design Blog Post! Hope you all had an amazing weekend! Mine was way too short, lol. Today I'm sharing a card in soft, sweet colours that I created with the Mft stamps Ready, Set, Snow stamp set. I entered this card to the running color challenge at MFT Card Challenges! I started this card by colouring my white base. I used a blending tool and Spun Sugar and Shaded Lilac Ranger Distress ink. 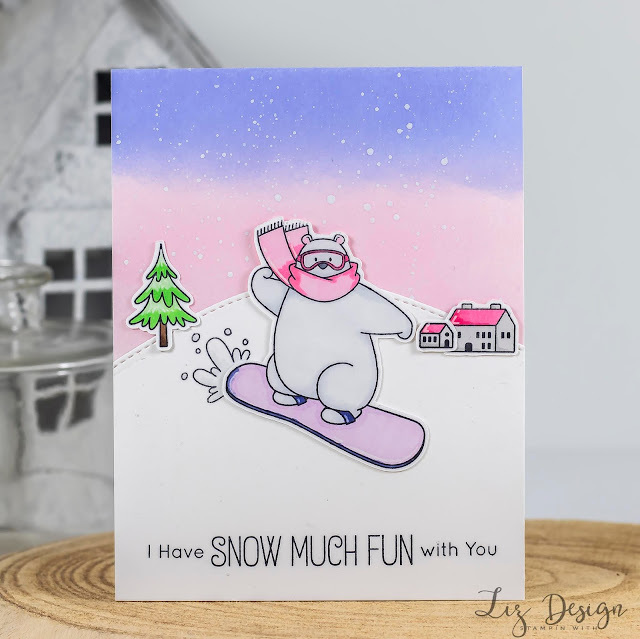 I added some white spatters on to my background to make it seem like it's really snowing! I used white paint which I added some water drops to, to make it more liquid so it will spatter better. Just a small tip! I then added my snow hill, I diecutted a piece of white cardstock with the Downhill Slope Die-namics. I stamped the text at the bottom and stamped the snow that the snowboard flips up on my underground. 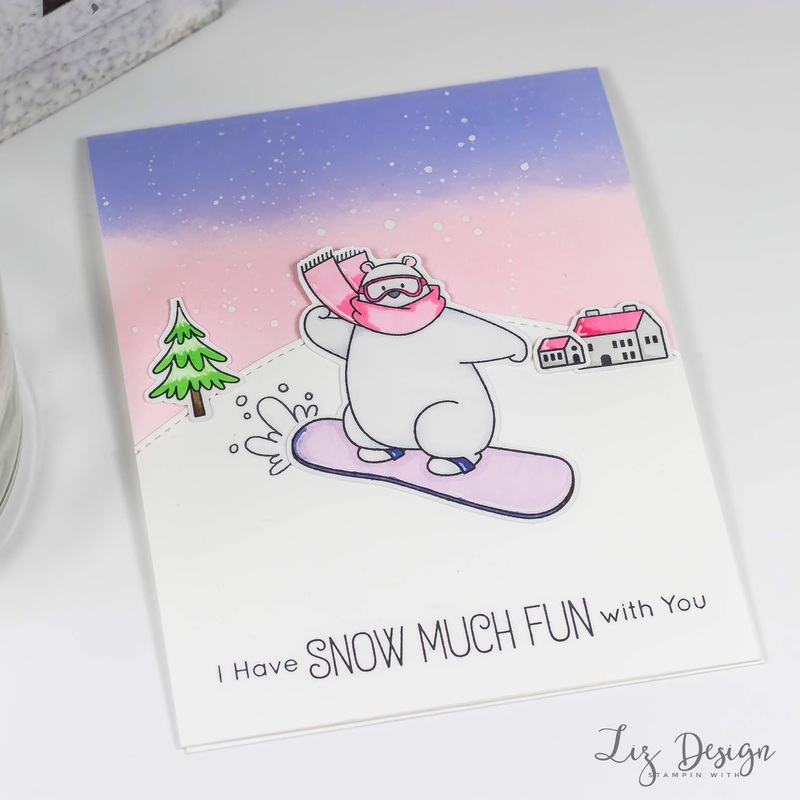 I stamped and diecutted my images with the coordinating Ready, Set, Snow Die-namics and then coloured them with my Copic Markers. I added the images with dimensionals on to my card. 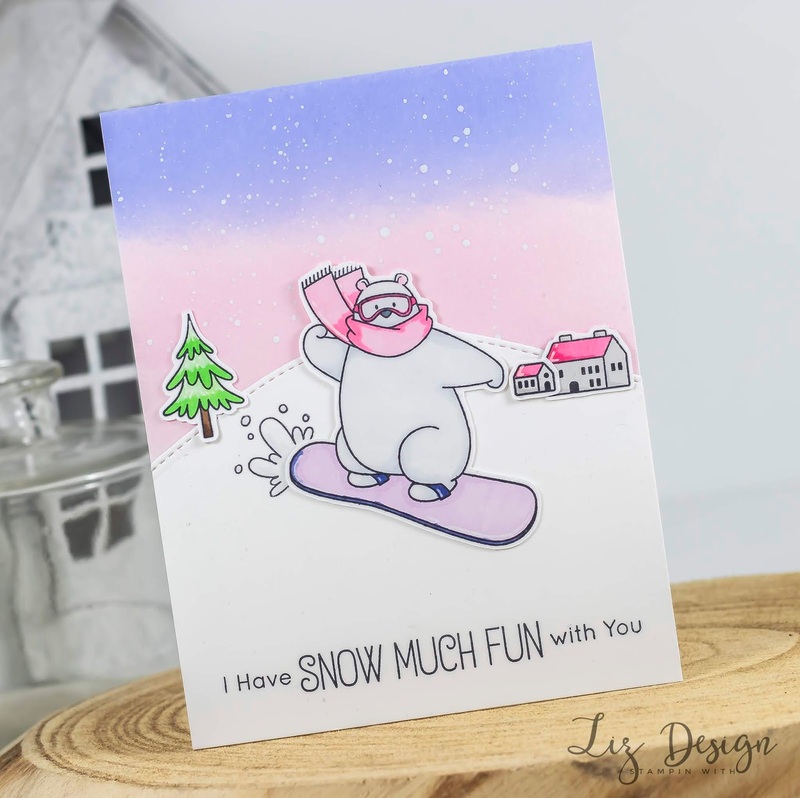 I just love this polar bear on his snowboard!